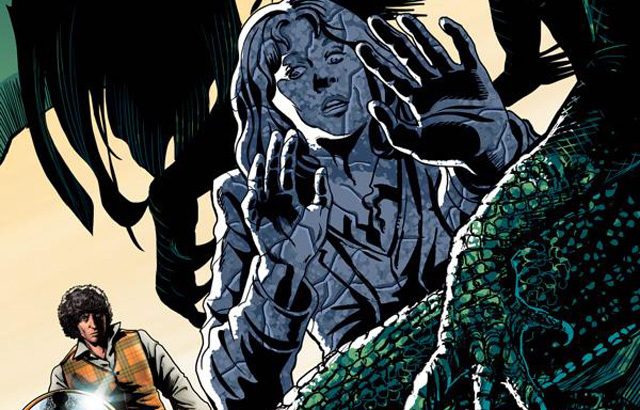 Titan Comics: Doctor Who - THE FOURTH DOCTOR #3 Review | Warped Factor - Words in the Key of Geek. Tony puts the kettle on and settles in for a chatty issue. Throughout the history of on-screen Doctor Who, episode 3 has always been something of an action graveyard. A tense action graveyard, to be sure, an informative action graveyard, certainly – the role of the third episode is usually to give us all the information we need for a conclusion – with the threat having been built and the Doctor’s involvement being contrived in the first two parts, and the solution coming in the final episode, part 3 has been the episode where we’ve hung about, waiting for things to happen, or learning about all the things that could happen – the things that make the threat scary, and the things that begin to give us an inkling of how the threat will eventually be understood, battled and defeated. Part 3 of Gaze of the Medusa pretty much sticks to this tried and tested formula – having separated our heroes into two groups, both in some way having temporarily escaped the attentions of the veiled Lady Carstairs, we learn more about the fate of those who have ended up as (presumably living) statues in her house as Professor Odysseus and Sarah-Jane are catapulted back to roughly the sixth century BC, while the Doctor and Odysseus’ daughter, Athena have run away with the Lamp of Chronos, a troublesome MacGuffin around which most of the drama of the story so far has revolved. We learn the nature of the giant one-eyed gibberish-speaking chaps in top hats who have been somehow subjugated by Lady Carstairs (there’s a groan waiting for you when you learn their name), and discover that they have something in the way of a special skill. But, perhaps more worryingly, one of them has been taken back in time with the Professor and Sarah-Jane, and, when it menaces them, Odysseus appears to give it an order in its own gibberish-tongue, which makes it run away. That never bodes well in episode 3. The Sarah-Jane and Odysseus arc is mainly used here to fill Sarah-Jane in on Athena, and to build the tension to what is – with the best will in the world – a very predictable cliff-hanger. To be absolutely fair, Sarah-Jane herself even predicts the cliff-hanger here, writers Gordon Rennie and Emma Beeby treating the reader with respect and not forgetting they’ll have read previous issues. The characterisation of Sarah-Jane through her dialogue here is excellent, with a real Elisabeth Sladen tone to it: she stops Odysseus from swigging from his hip-flask, asks questions about Athena and the man with whom she’s involved, and makes some salient points about the nature of the danger they’re in. Between them, the arcs allow us just enough new information to start pulling some threads together and perhaps just wonder if our heroes are fighting on the right side – a stray line of Athena’s, added to her father’s apparent command of one-eyed-dude gibberish, makes us reassess everything we know, and while the cliff-hanger is heavily foreshadowed, it allows us to move on in issue #4 with the ‘Doctor arriving to save the day’ portion of the story quickly. There’s every likelihood that the story’s about to get more complicated than it at first appeared, and issue #3 sets that up neatly and without too heavy a hand, while making sure we’re pretty well primed for it if and when it comes. The artwork in this issue faces a handful of challenges – most notably the fact that the story here is mostly ‘stand around talking’ fare, rather than ‘battle for the fate of the universe’ material. Nevertheless, Brian Williamson delivers all the elements required with a practiced hand – as we’ve mentioned before, there’s a degree of legend-printing in this first comic-book outing for the Fourth Doctor and Sarah-Jane, but when you have legends of that quality, there’s no real bad in that. Williamson’s Fourth Doctor is effective, matching the quality of the visuals to the voice that Rennie and Beeby give him, and likewise, it’s good to see Sarah-Jane reliably rendered in these issues – it helps us buy into the relativity of our favourite show to see her again, doing the things that Sarah-Jane would. The other characters too have a coherence to them, despite being, as everyone is in this story, very distinctly ‘drawn’ rather than photo-believable. 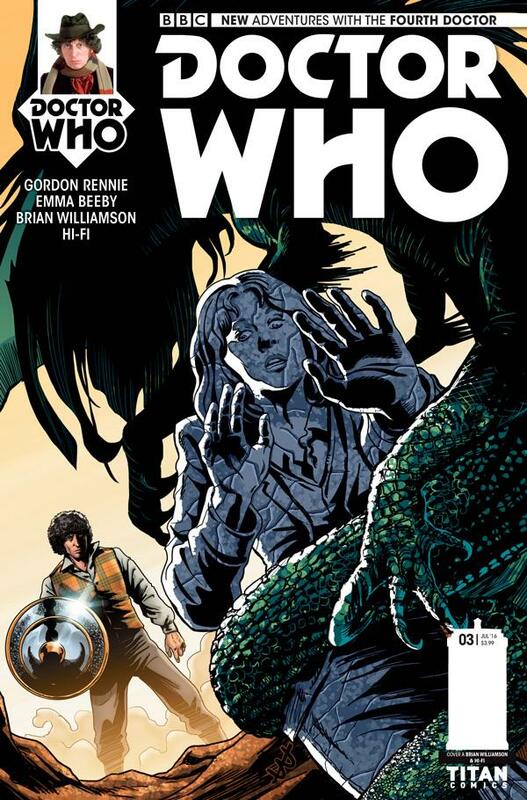 Williamson pitches his style towards the gothic end of the Fourth Doctor spectrum, and creates a world that feels comfortable for the Fourth Doctor, albeit later than what we know as Sarah-Jane’s time. If there’s a nit to pick with the art in this issue, it’s with the final page, and the reveal of the Medusa itself, which, compared to some recent Titan Who comic-books, doesn’t punch with the impact we’ve come to expect. That said, the artwork and colourwork (from Hi-Fi) throughout the rest of the issue is solid and, particularly in terms of the colourwork, brings occasional bolts of surprise, including a panel showing the use of a MacGuffin to defeat a villain, and several ‘shots’ of the Lamp of Chronos in some kind of action. So, one to get? Well, to a certain extent, that’s a no-brainer – it’s the Fourth Doctor and Sarah-Jane, back in action! Admittedly the ‘action’ they’re back in is a little muted here, as they take to explaining things and asking questions without in fact actually getting very far. But still, Rennie, Beeby, Williamson and Hi-Fi do enough to justify parting you with your money. Just bear in mind that this is an episode 3 issue, and it will still give you lots to ponder over, revel in and be grateful for.